As the future of advertising is ever changing to suite a more engaging and interactive experience, be sure to think of how you can incorporate this in your next marketing campaign. 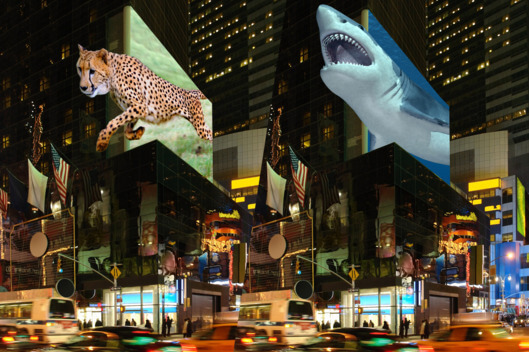 A 3D advertisement is more likely to capture and hold interest to someone than that of traditional means. There is an in-depth study done from The National University of Malaysia on this you can read here. Displaying your company logo or product in 3D will help the consumer better visualize what you are advertising…thus increasing sales! Read some more on 3D ads and their benefits here. Having a holographic display just looks cool in the end, as well as highly engaging. It’s like going from 8-bit graphics to a VR experience and there is just no comparison. Capturing the attention of Millennials can be difficult as their attention span is now less than that of a goldfish. This can be attributed to smartphones and video games that are ever more interactive and engaging. Facebook is just one company that will be incorporating 3D interactivity into their arsenal with 3D posts coming soon. Holographic displays are a new and trendy way of capturing this segment of the populations attention. Read more on the Microsoft study findings here. From the beginning you have a vision and purpose for a successful marketing campaign for your company and products that you want to turn into a reality. Do you have a specific 3D scene in mind or want to render your product as realistic as possible? Working with a company such as Holocube, our 3D designers will make sure the visual aesthetics are legendary. … “We’ve already seen dramatic shifts in form and factor, powered by technologies such as 3D, artificial intelligence, augmented reality, and virtual reality. As the landscape continues to change, advertisers that don’t follow suit risk getting left behind.” As technologies evolve so should your advertising techniques. Read more marketing insights from this snippet here. 7) It’s Social Media Worthy! Not only will a holographic display look cool, but it will be highly engaging for the consumer. This means they are more likely to help you advertise as well by taking pictures and videos of the display to share with friends and family increasing your brands outreach. Just take a look at some of the awesome displays we’ve made here. Not only will the consumer be amazed by what you’re displaying, you can show them you have heart and passion for your product as well. This creates a strong relationship from that experience with the consumer at the end of the day. If you have nothing left to discuss, this provides a sure-fire way of creating conversation. From the technology used to the storyboard design, there’s plenty of opportunities to strike conversations with anyone curious. Once you make a 3D scene for your product you are satisfied with, you can reuse the display for any other marketing campaigns/advertisements you have in mind for the future! We provide a 3D holographic projection display to introduce your brand and product without the need for 3D glasses or any other devices. Located in Toronto, we offer service worldwide.